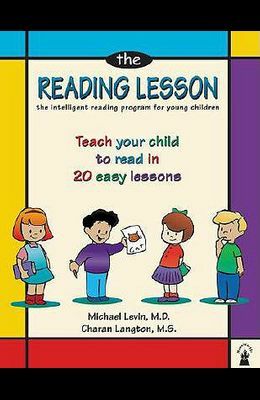 The Reading Lesson is a bestselling program that teaches young children to read in 20 easy lessons. It is designed as a step-by-step course for parents who want to teach their young children to read at home. The teaching method is based on phonics and key-word recognition, and with its innovative and guided approach, the 20 step-by-step lessons provide an easy-to-follow recipe for teaching children to read. Developed by pediatrician Michael Levin, the program has also been used successfully for children with disabilities. How do I use the Reading Lesson? There are twenty lessons in this book. Each lesson takes about two weeks to complete (with about 15 minutes of study per day). Before starting a lesson, we suggest that you read the instructions for that lesson. Each lesson begins with an introduction and a description of how to proceed. For example, lesson two introduces the letters m, d, and r. At the beginning of the lesson, there is an introduction with some words of advice and thoughts on how to go through the sounds of those letters and how to read them in words. Each lesson consists of words, exercises and short stories. When reading the words, ask the child to tell you what the word means. Before you read the story, read the title and talk a little bit about the content of the story. Approximately 300 key words form the basis of reading skills in this course. Each lesson introduces a set of key words. Your child should learn them well before you proceed to the next lesson, since these words are used in later lessons. For many young readers (including children who are familiar with the alphabet), the letters in words seem to melt together. The instructions in Lesson One teach the child basic sound blending. The special typography and font style the book uses will help your child to identify and separate the letters she already knows. These bars, dots, and special graphics are there as guides and are used to blend the sounds into words. This process is called sounding out. At first, blending is difficult for most children. You will need to help the child but he will get better at it with practice. How fast should I go through the book? The length and the pace of the daily lessons will vary with your child's age and abilities. We suggest the following schedule: For children under five, one page per day will suffice and maintain their concentration on the lesson. For children between five and six, two to three pages per day will be sufficient. For children over six, three or more pages per day will be fine. Children have a very short attention span. Try to keep each lesson under fifteen minutes, and spend no more than five to seven minutes per page. If your child is young, don't rush Work at a leisurely and comfortable pace. Remember: you have plenty of time to complete the course and, if necessary, to go back and repeat the course before your child starts reading instruction in school. How old should my child be when we start the Reading Lesson? The book is meant for children between the ages of 3 and 8. We do not suggest that you try to teach a child under the age of three to read. Contrary to some books that suggest that you can teach infants to read, there is no proof that such a thing is possible. Children need certain developmental skills before they can read. Flashing cards with letters and words at a baby is a fun thing to do and makes us feel like good parents, but it does not work The Reading Lesson is a totally developmentally appropriate course that is easy to follow, and makes learning to read fun for parents and kids. The book is an easy and cheap solution to teaching your children to read at home, and has been a success with families all around the world. Give it a try - you're sure to love it.